Darius Law and Lamarra Currie of Charlotte have been named the Atlantic 10 student-athletes of the Year in men’s and women’s outdoor track & field, respectively, in voting conducted among the conference’s sports information directors. Currie established meet records in the 100m (11.44) and 200m (23.46) dashes on May 2-3 as she defended her titles in both events at the 2009 A-10 Outdoor Track & Field Championships. A finalist for the Arthur Ashe Jr. Academic Award and a three-time Academic All-Conference selection, Currie boasts a 4.0 grade point average as a psychology major. 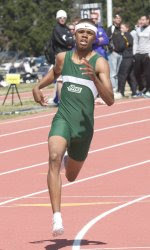 Law defended his titles in the 200m (20.70) and 400m (46.60) dashes and was a part of Charlotte’s winning 4x100m (40.57) and 4x400m (3:13.58) relays at the 2009 A-10 Championship as the 49ers captured their second team title in four seasons. Charlotte’s time of 40.57 in the 4x100m relay established a meet record. An accounting major with a 4.0 grade point average, the Raleigh resident is Charlotte’s first-ever Student-Athlete of the Year in men’s outdoor track & field. Congratulations on being a super college athlete and an even better student.